Ntirenganyi Kamamba wasn't yet born on the horrible day in 1999 when the rebels came for his father. "The story about how my dad was killed, I get from my mother," said Karamba, a senior kicker on East's state championship football team. "They don't give the GPS address, they just describe how our house looked. My dad was home and all the money he had, he gave to them. But they say, 'okay, we still have to kill you because if we don't, we know you will snitch on us to the government.' They killed him and my mother couldn't say anything because she would get killed too." Machetes were the rebels' preferred method of killing; guns might possibly attract the attention of the opposition. On that day when the rebels beheaded his father, God must have seemed very far away. Yet there's no doubt in Karamba's mind that God's hand has been guiding his journey, one that has carried him from the Democratic Republic of the Congo to being a state champion, a sophomore and junior class president, a pizza connoisseur and — despite having to learn a new language — a fine student who aspires to be a gynecologist. 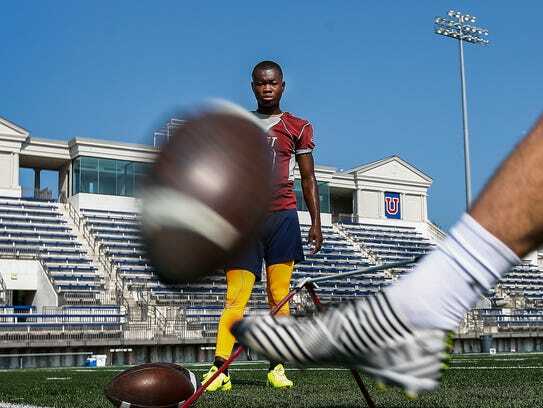 "He's probably the strongest person I know, mentally," said MUS kicker Trey Thomas, who came to know Karamba through their connections at Christ Methodist Church and who has helped harness his kicking potential. "I'm blessed to work with him. He's always cheerful ... always has a positive attitude. It's not like, 'oh, I'm no good. I hate this. I'm giving up.' Which — I'm not going to lie — I kind of have that attitude if I'm just shanking field goals left and right. "But Karamba, he just keeps doing it, keeps doing it. He's never given up. I love him." Love was in short supply in Karmaba's country during the civil war that raged from 1998 to 2003 and saw the deaths of hundreds of thousands of his countrymen, including the president, Laurent Kabila, who was assassinated by his own bodyguard in 2001. At one point, Karamba witnessed the barbarity first-hand. "They say, 'we see you have crops so here's the thing. You will sell your crops and we will come pick up the money tomorrow.' But he didn't sell them and they killed him and sold the crops themselves. There were a lot of people looking but there were no (opposition) soldiers to help. And if anyone tries to help, they will get killed too." "When you see the way they kill like that ... it's a scary thing." Karamba, his three brothers and his mother were among the lucky ones. They eventually found their way to a refugee camp in Uganda before beginning the long and arduous process that would eventually land the family in Memphis. "We stayed there for two years and then they started processing (us) and starting interviewing about coming to America," he said. "We never thought about coming to America. The interview process took three years and then after five years, they told us we are ready to go. "We said, 'wow, that's a big deal.' In that refugee camp, there were people that were there for 15 or 20 years and they never got a chance to come to America. The refugee camp ... life is very difficult. "Getting food, getting water, everything is difficult. There is a big disease which kills people every single day, malaria. The government tries to provide medication but it's not enough. We take medication for malaria but we still have water that is not clean." "In America, everything is perfect," he said. "We have a lot of things we can use, good friends, good neighbors to help us when we have problems. Even when we are not 100 percent with our English, we still feel happy here and lovely with our friends. "Here, people say, 'hello, how are you? What church do you go to? Would you like to come to my church and hear the word of God?' For me, that is a great thing." And — being in the South — it wasn't long before Karamba got caught up in another activity that stirs the faithful, high school football. "When I was in 10th grade, a coach (assistant Charles Smith) at my school said, 'hey, do you play soccer,'" he said. "I said, 'of course.' I played for a long time in my country. He said, 'could you play American football?' And I said, 'oh no!'" East head coach Marcus Wimberly adds, "When he first came out, he was a little ... erratic. But he's worked hard and really improved, a lot of the time by himself. He definitely won some games for us last season with his extra points." Indeed, it was Karamba's clutch extra point that sent the Mustangs to last season's Class 4A state championship game as they defeated Nashville Pearl-Cohn 14-13 in the semifinals. For the season, he converted 33 extra points and was perfect on three field goal attempts. Not that it's always been smooth sailing. Walter Hughes — an East supporter who coaches youth teams at Christ Methodist and who introduced Karamba to Thomas — recalls a game last year when the player made a field goal before Wimberly took the points off the board after a penalty put the ball on the 5-yard. The Mustangs got the touchdown. "But Karamba didn't understand why he didn't get his three points," Hughes laughed. "He wanted to be credited." Karamba said, "When I saw pictures, I said 'there's people that play this?' (At East) they ask me to kick the ball like I kick a soccer ball. The first kick ... it went up like they wanted it. Coach Smith told me I could be a football kicker. "But I was very scared of being hit. My first game last year was against Cordova and we lose ... but every day I keep getting better." So much better that now he's able to give Thomas — who set a Shelby-Metro record with 19 field goals last year — a good run for his money. And he's even learned trash-talking, albeit in the most polite possible way. "We were having a punting competition and Karamba's punts were really good but they were going through the end zone," Thomas said. "The whole game was to put it closer to the 1-yard line. He was like, 'Trey who won?' And I was like, 'I did right?' And he was like, 'oh no, I disagree.'" Said Wimberly, "I told him this year that if he could hit a 35-yard field goal, he'd get a single-digit (jersey). But he's been kind of bragging so I upped it to 45. "We were a tight-knit team last year and the guys kind of took him under his wing. I think — coming from the background he had and some of the experiences — his given the guys a different perspective. After I read it ... I felt obligated to post it.